Hide.me virtual private networking (VPN) providers are based in Malaysia and they offer a great anonymous web browsing experience to customers. The company does not keep any logs at all, so customers can be assured of total anonymity while using the Internet and they operate their own servers via software which has been custom written for their application. Hide.me servers are located in almost 20 different countries and offer access to the most popular geo-restricted sites available. Customers can check out the free service offered by Hide.me, this is more limited than paid plans but if a consumer is simply looking for basic VPN services from a reputable provider it is a great option. The free service only gives limited data transfer capability from two server locations. 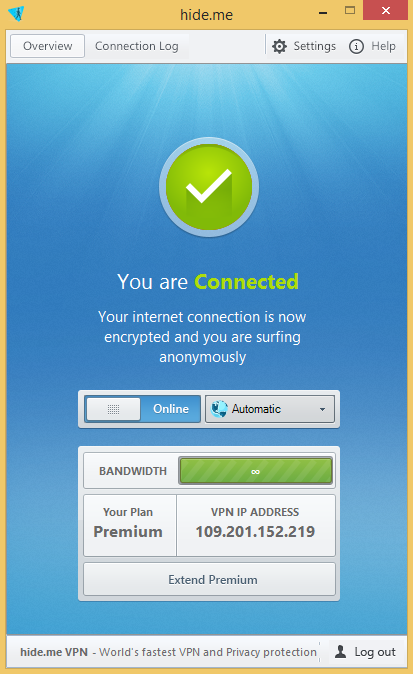 The paid plans give consumers more flexibility, with the Premium service offering customers the option to have five simultaneous VPN connections. It’s easy to set up Hide.me on a number of devices, such as Android, Mac, PC and any router. The Hide.me website offers customers options to carry out manual or automatic downloads of the service. Adding the Hide.me VPN to an iPad is just a matter of downloading the app or following the steps in the provided tutorial. Protocols available to iPad users include PPTP, L2TP/IPSec, Open VPN and IPSec/IKEv1. Hide.me recommend iPad users adopt the IPSec/IKEv1 protocol for their device. The first website step for customers wishing to manually load Hide.me to their iPad is to choose the protocol and the server, customers then need to log into the Hide.me service in order to gain access to further written instructions. From the settings menu of the iPad it is necessary to select the General option which brings up a range of options. One of these options on the right hand side of the General screen is to select network and VPN. It is then necessary to configure the VPN settings for Hide.me. Users firstly need to select the desired protocol and then add a useful description name for the VPN network in the Description pane. The chosen server should be input into the relevant box and customers then need to complete the account and password fields, which should be input in the exact way they are used on any device the customer uses to access the Hide.me network. Nothing needs to be input into the RSA SecurID pane and it should remain switched to the Off position. Send All Traffic box needs to checked into the On position. Once all the required fields are complete the customer needs to click the Save button which is located in the top right hand corner of the screen. The iPad will save the configuration and the screen reverts back to the General screen, where the customer will see the new VPN network is itemised. It’s then just a simple case of selecting the Hide.me connection by clicking the On mode any time the customer wishes to connect the iPad to the VPN network. When the VPN is activated customers can log into the Internet from any WiFi hotspot with peace of mind, as all communications will be securely encrypted. The customer will need to turn the VPN to on every time the iPad has cut into sleep mode or lock screen, as the network is automatically terminated by the iPad at this point. Adding Hide.me to an iPad is really simple and customers can change server locations when needed to ensure they get the best possible service from their provider and have the ability to access any geo-restricted sites around the world.